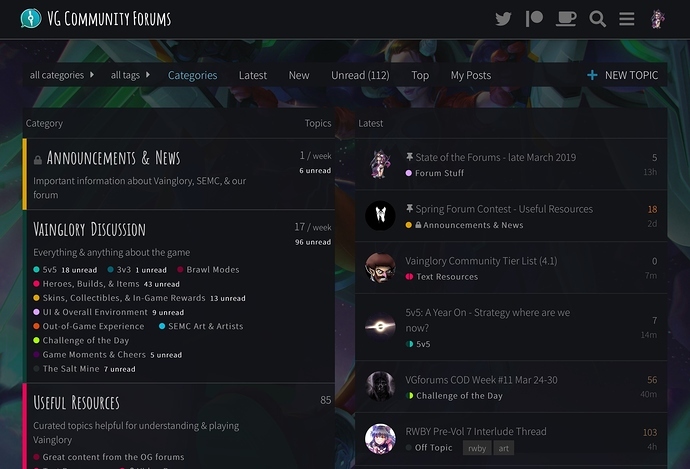 With the recent increase in new users, I wanted to throw together a guide to using these forums to help give some of them a more enjoyable experience, as it’s hard to really know about some aspects of the site without some level of research. Plus, who knows, some older users may also learn a thing or two! Welcome to vgforums.net! If you haven’t already noticed, this is a community-run forums site for the mobile and PC game, Vainglory. 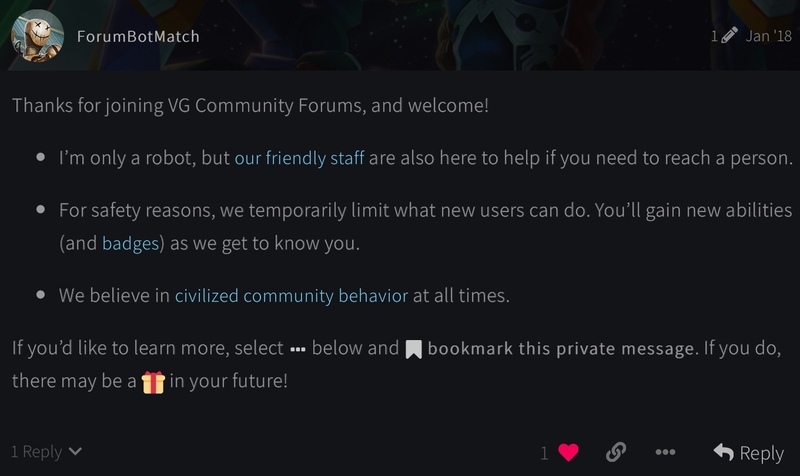 Because we are community-run, we have no formal relationship with Super Evil Megacorp, and we are unlikely to have one. 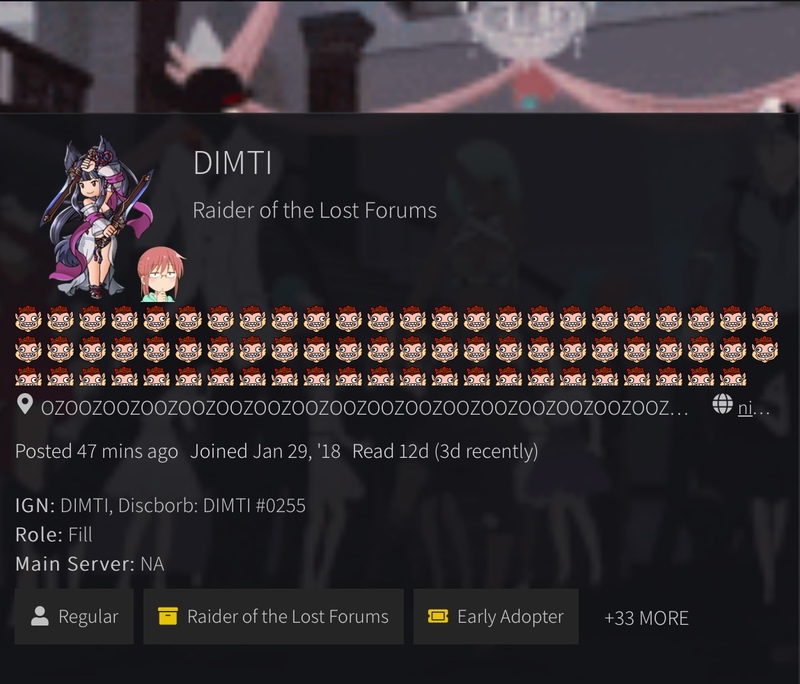 It was established by our lovely mod team about a year ago in light of the official forums’ closure, and we’ve certainly grown a lot since then. Thank you for joining our community! If you would like to support the site, you can provide monthly donations through the site’s Patreon page, one-time donations through the buymeacoffee, or follow the site’s Twitter page (all three of which are accessible via the top of the site). This is the main page in its desktop and mobile views, respectively. 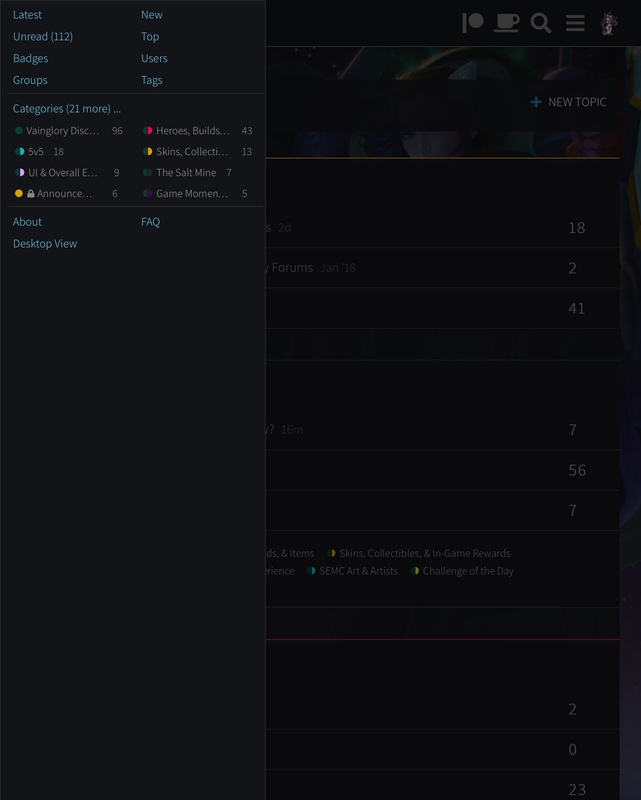 Nothing too complicated, it simply allows you to access the various topic categories, create a topic, and view threads with recent activity, among other functions. The site logo; it simply takes you to the main site page. The social and donation platform logos; they redirect you to the previously mentioned Twitter, Patreon, and buymeacoffee pages, respectively, for the site. 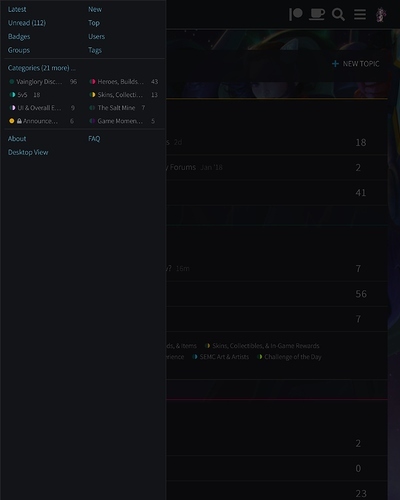 The search bar; it allows you search for topics, posts, users, or categories. Clicking on “options” takes you to the advanced search should you need it. The expanded navigation tab (represented by the three horizontal lines); it provides you with various ways to view posts (such as by latest, or by tags), and allows to access the badges, users, and groups pages, among others, and lets you swap from the mobile view to the desktop view (and vice-versa). Blue notifications are for general matters such as a reply to one of your posts, a like on a post being received, or another user tagging you. Green notifications, on the other hand, are specifically for private messages - from a secret admirer, perhaps? 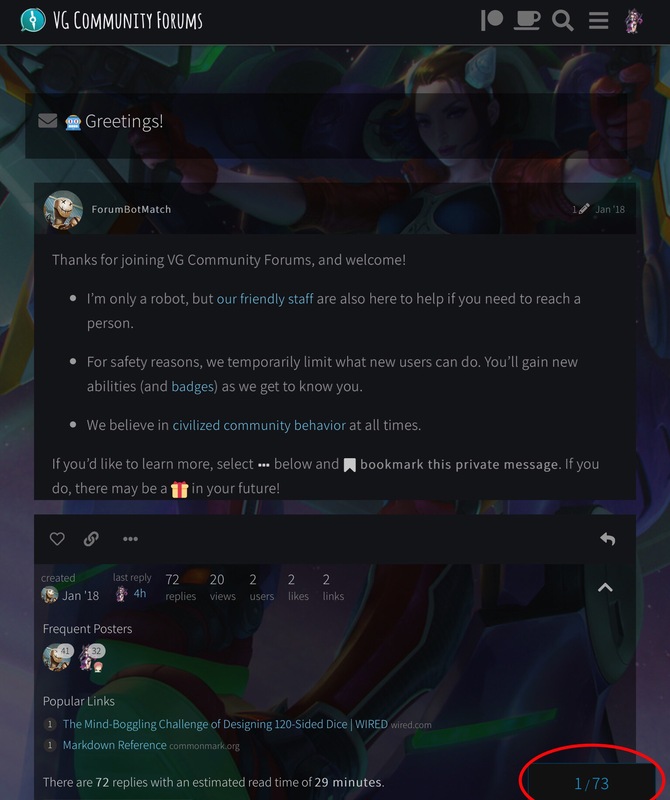 Additionally, the expanded navigation and user tabs can be pulled out on the mobile version of the site by swiping right on the left side of the page or left on the right side, respectively. 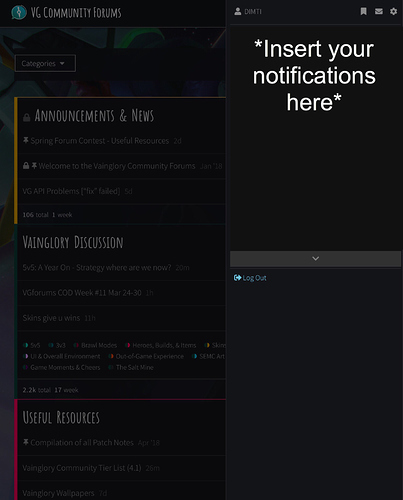 If you are viewing a thread in desktop mode, you might have noticed the slider on the side of the screen that moves as you go though the posts. The blue slider can be dragged up and down in order to navigate to a specific post. On the mobile version of the site, however, you need to tap on the post number indicator on the bottom right of the site in order to bring the slider up. In addition, you can tap on the “jump to” in the bottom left of the slider menu that appears in order to go to a specific post. Useful Resources; for resources, such as guides, that are helpful for other players in regards to the game. 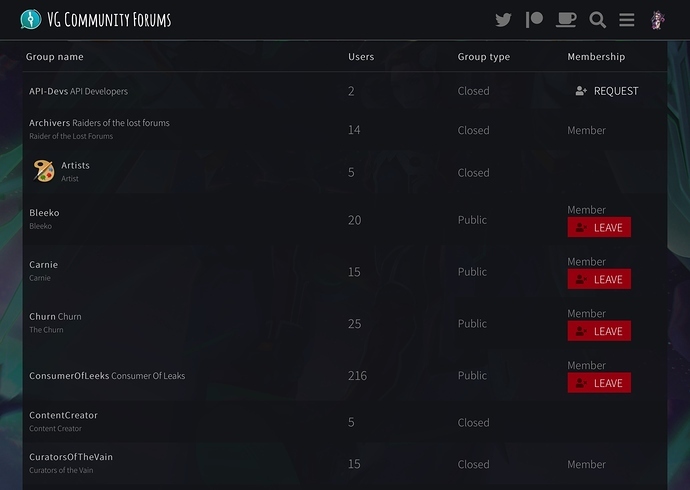 This category also includes a sub-category, Great content from the OG forums, that holds an archive of useful threads from the official forums prior to their shutdown. Fan Creations; for fan-made content, such as art, hero ideas, and lore. 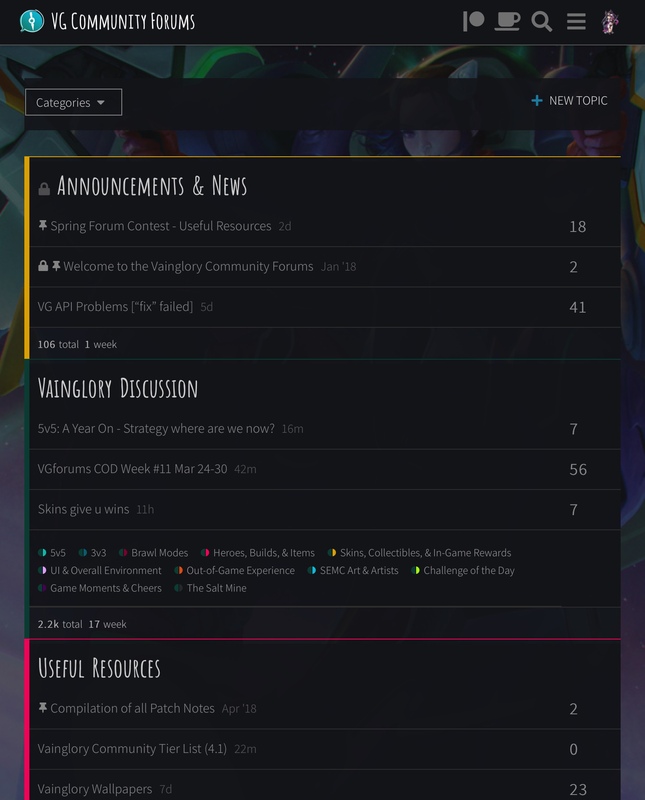 Guilds, Teams, Esports, & Tournaments; for guild/team recruitment, esports discussion, and tournament advertising. 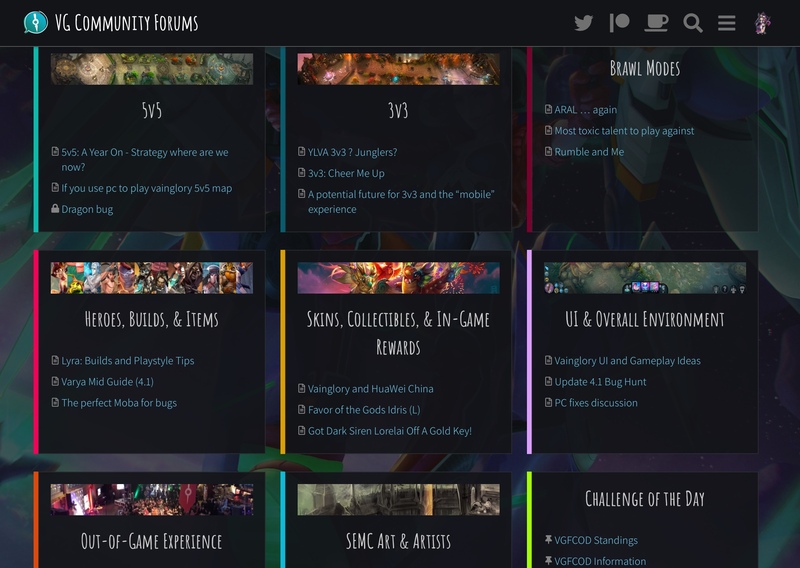 Forum Stuff; for matters concerning these forums. Help! ; for trying to get help with in-game matters. Off-Topic; for discussing anything non-VG related with your fellow users. 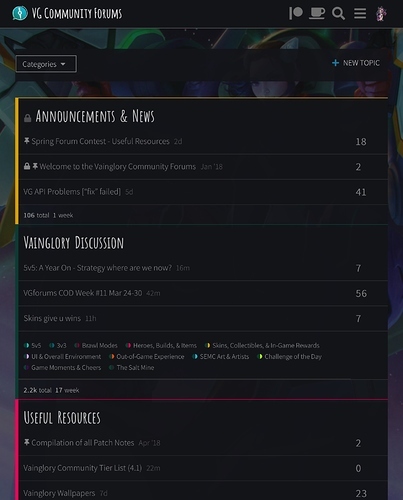 The Broken Pipe; for showcasing and discussing VG content leaks. It can be accessed by joining the Consumer of Leeks group. More in-depth explanations of each category’s purpose can be found on the “about the category” posts pinned to the top of each. 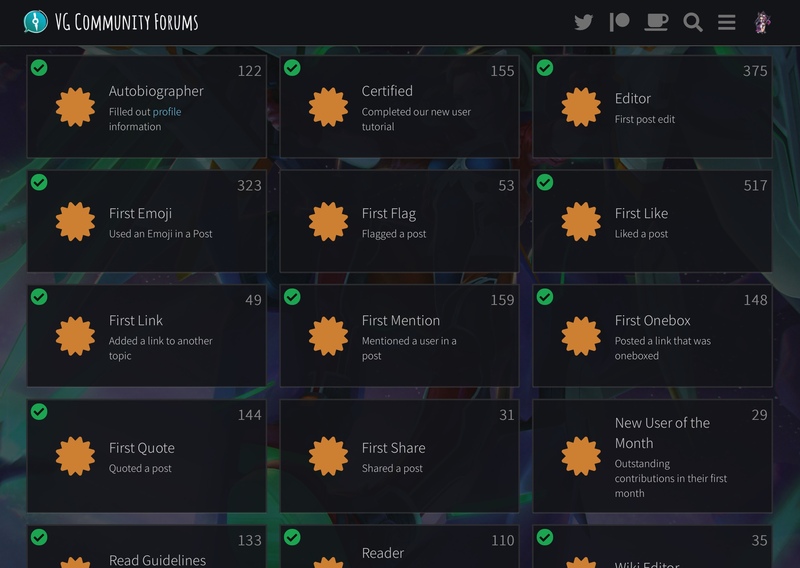 The Badges page allows you to view all of the earnable badges for being active on these forums. The badges are simply achievements for being active or doing specific tasks here. In addition, you can view the various trust levels available for active participation here, as well as some of their benefits, ranging from getting a higher like-per-day cap to being able to recategorize posts and rename other’s topics. In-depth information about trust levels can be found in this thread by @Moose. The Groups page allows to view and join the various groups here on the forums. 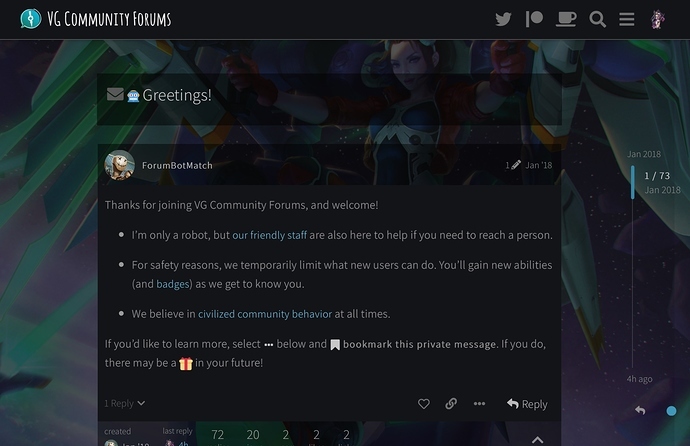 Most just provide visual perks to your profile, such as adding an indication of which server(s) you play on or providing you with a title or flair. Some however, allow you to view and/or post in certain categories, for example joining the Consumer of Leeks group grants you access to The Broken Pipe category for leaks. A quick note of flairs: your flair is automatically set to the one of the last category you joined, regardless of whether or not it actually has one (if it doesn’t, you’ll have no flair). In order to regain the flair, simply leave the group with the desired flair and rejoin it. You can also receive a custom flair by reaching the “regular” trust rank then kindly messaging one of our mods. It’s your own personal profile page! Wow! Here on your profile page, you view various aspects about your activity here, such as your posts, notifications and private messages received, and badges earned. In addition, the “preferences” section allows you to freely edit your profile page. Why not change your profile picture to something cool or say something interesting about yourself? Furthermore, you can change your profile and user card backgrounds (even to a gif!) 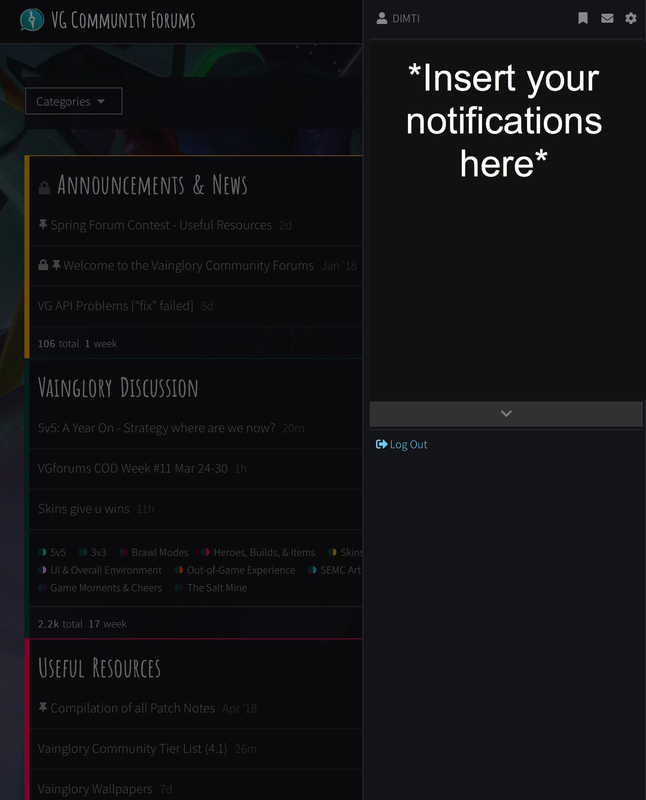 here, edit your notification settings, or even change this site’s background image to one of the newest skin or hero splasharts! If you are using the desktop version of the site, you can click on a user’s profile picture in order to make their user card appear in order to get a brief overview of them. Nothing too wild, but an interesting feature nonetheless. When posting, make sure to be civil, stay on-topic, and most importantly, follow the rules! In addition, try to avoid discussing multiple different topics when creating a thread. It is best for discussion’s sake to focus on a single topic rather than multiple topics that don’t completely relate to one another. If you want to address another topic, then great! Make a new thread for even more discussion! Lastly, please avoid bumping/reviving long inactive threads. If you would like to bring a topic already discussed in a thread back up, then it’s best that you create a new thread about said topic and reference/link the old thread in it. Making threads and replying to posts is an extremely easy task to do. To create a thread, simply click on the “new topic” button around the top right of the main page or a (sub-)category’s page. You will need to select a category to place your thread in if you are doing it from the main page, or if doing it from a (sub-)category’s page, it will automatically be placed there. After that, type away! As for replying, simply click on the “reply” button at the bottom right of a specific post you would to respond to or click on the “reply” button underneath the last post to make a general reply to the thread. Then, speak what’s on your mind! After finishing your post, simply press the “create topic” or “reply” button at the bottom left to let your thoughts out into the world! Bold; makes your text bold. Italics; makes your text italic. Instert Hyperlink; allows you to turn a link into a hyperlink. Preformatted Text; allows you to add text without *text* **formatting**. Grid Gallery; allows you to organize multiple images in a grid format. Carousel Gallery; allows you to organize multiple images in a handy carousel. Add an Image; allows you to attach an image from your device or the web. Additionally, this can also be done by dragging an image into the text field. A second button for this is also available on the mobile version of the interface, without a need to pull out all of the tools. 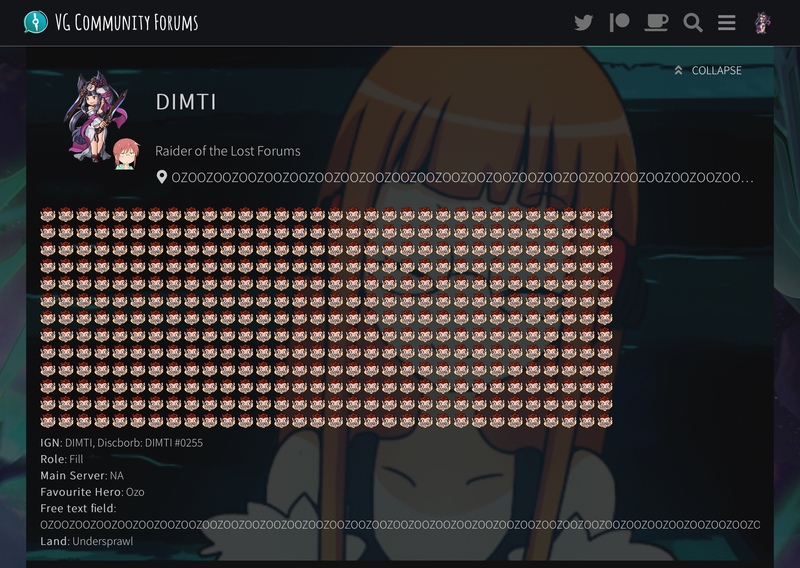 Emojis; allows you to browse all of the available emojis, which includes this site’s VG-related ones at the bottom of the list. 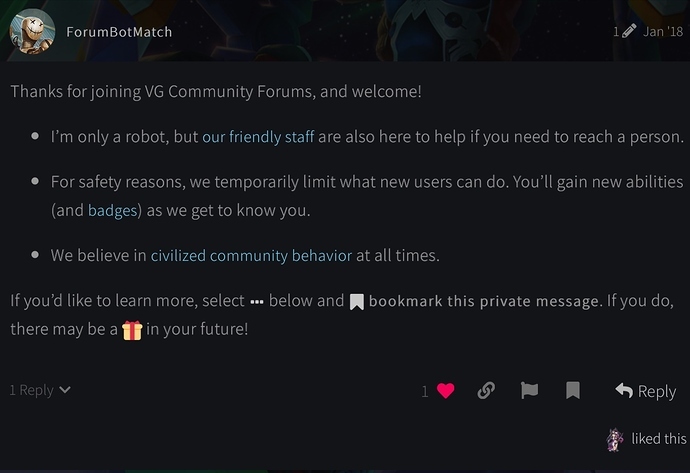 A quick tutorial of these tools, as well as a few other aspects of this site, can be done by going into the “ Greetings!” message automatically sent to you by ForumBotMatch. 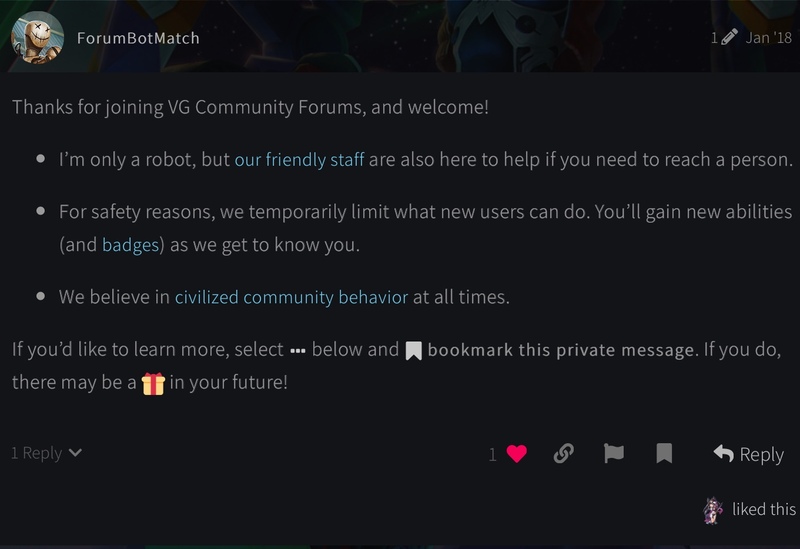 After completing that, the second, advanced part of the tutorial can be accessed by replying @ForumBotMatch start advanced user in that message thread. Additionally, because this site is run on the discourse forum architecture, Markdown is the primary formatting code, but some HTML and BBCode can be used for formatting as well. Once a post is submitted, you have some ways to interact with it. For others’ posts, you have the option to like it by clicking on the heart button or share it with the chain button. However, by clicking on the three dots, you can also gain the options to flag the post or add it to your bookmarks. Please make sure to flag posts that are inappropriate or don’t follow the rules in order to keep this place civil! You can also see the edit history of a post (if it has been edited after a certain period of time) by clicking on the pencil icon at the top right of the post. Finally, if you have reached the “basic” trust level, you can edit wiki posts by clicking the “edit” button that takes over the “reply” button’s place. 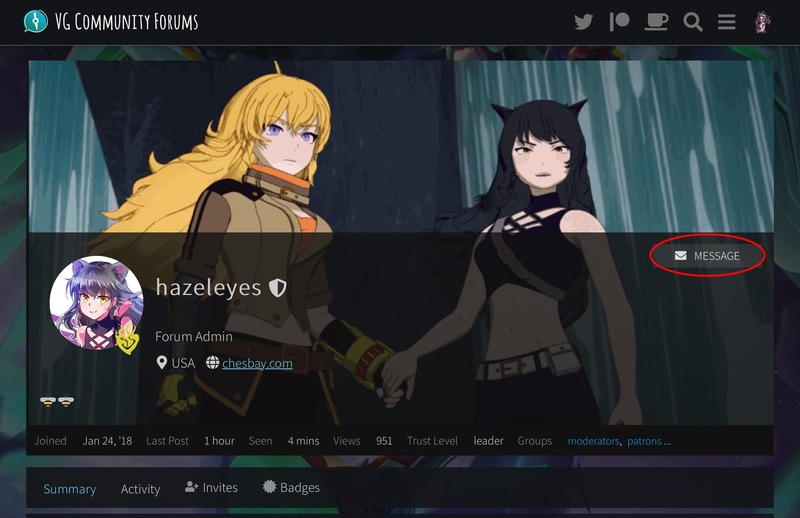 As for your own posts, you can choose to edit your post with the pencil icon, delete your post, restore your post if you attempted to delete it (there is a 4 hour limit on this unless the post is flagged, however), or turn it into a wiki if you have reached the “Regular” trust rank. Sending a private message to another user is very similar to creating a topic. Simply navigate to the “messages” tab, click the “new message” button, and enter the username of who you want to send a message to, granted you have the “Basic” trust rank in order to create private message threads. However, this can also be done by pressing the “message” button on another user’s profile. 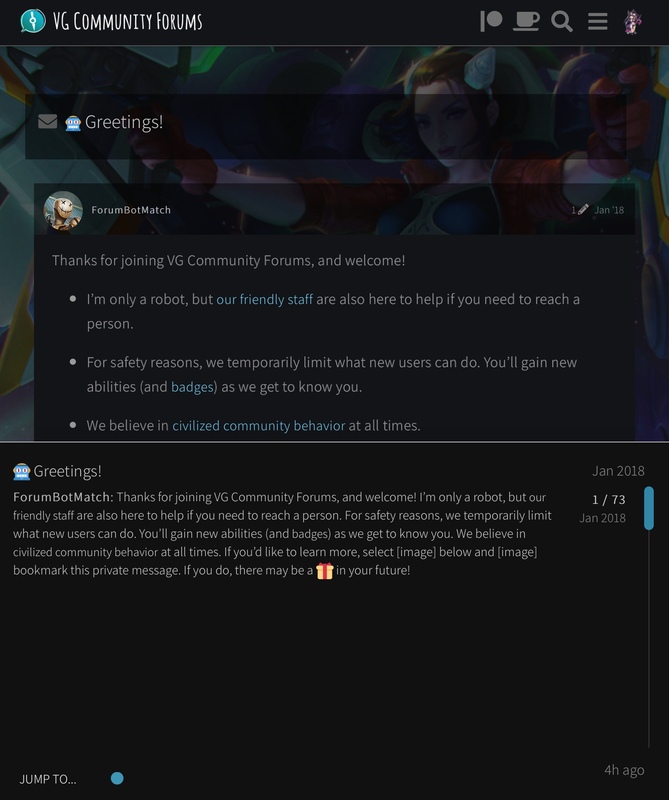 I hope this guide to these forums was useful, as I thought it would be nice to provide some help to new users (and possibly some older ones) in using this site.